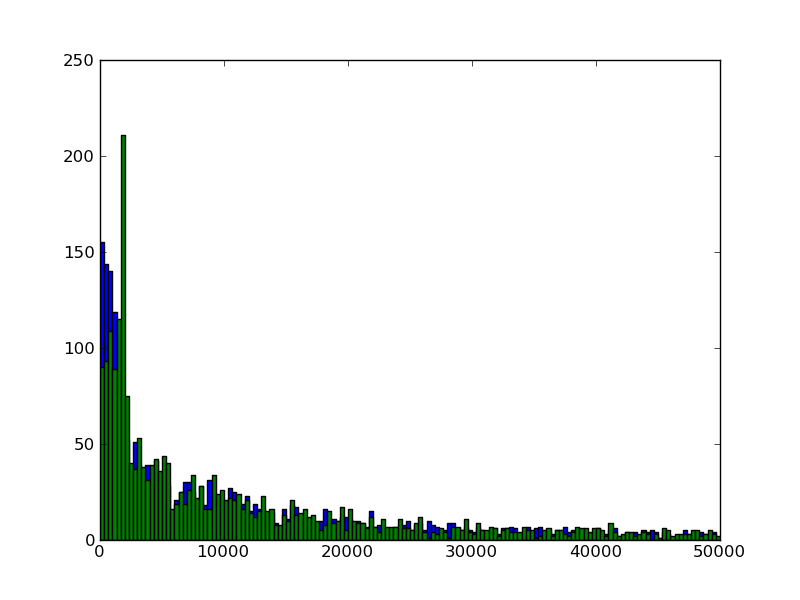 Using tweepy I've been looking at the characteristics of my Twitter following. 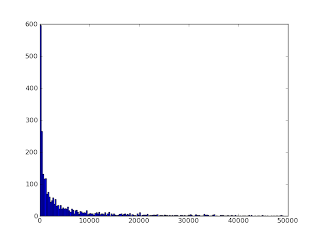 I found these histograms pretty interesting. The first shows how many people my followers are following and followed by. 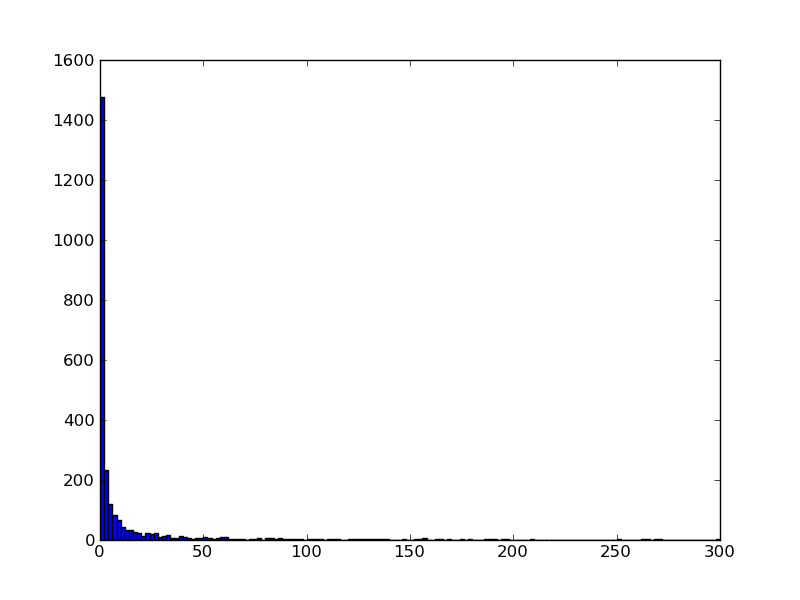 (The x-axis is the relevant number, the y-axis shows how many incidences of that number of friends/followers occur). Followers (Blue) and Following (Green). Next is the number of status updates posted. Looks like lots of my followers haven't tweeted much at all! It's a dilemma: do I unfollow them for being inactive? But, because the inactives aren't tweeting, they aren't flooding my timeline with stuff I don't want to read, either... Twitter-vanity might make me keep them, just so that whatever bot is running those accounts doesn't unfollow me. Finally, number of favorite tweets by user. Lots of people don't seem to use the "Favorite" function of Twitter at all. I probably have less than 10 tweets I've marked as "Favorite" (it seems like such a commitment). It's nice to be able to tag a link or something worth going back to later, so I'm glad Twitter has this feature... even though it is, apparently, hardly used. Then there are a few accounts at the far right of the distribution with lots of favorites. What's going on here? 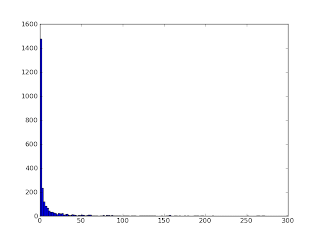 Generally the distributions resemble a power law, which is not surprising when looking at social networks. 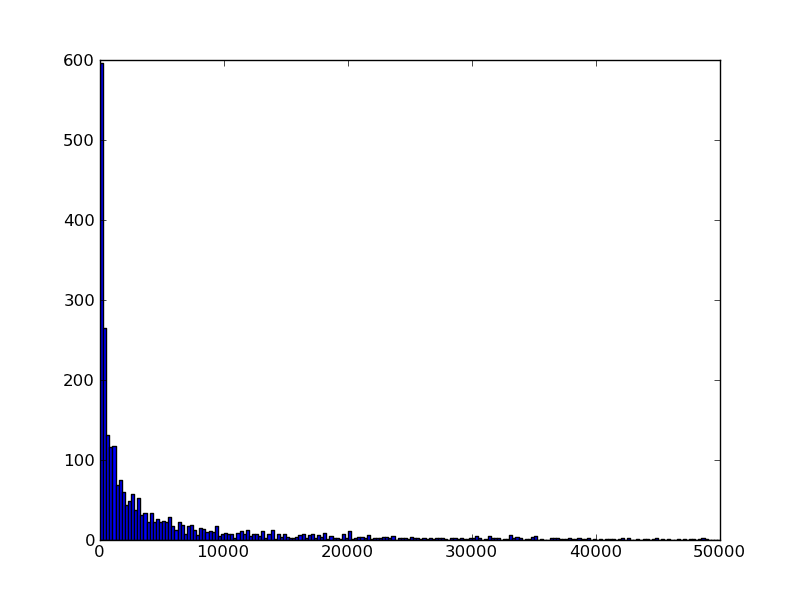 Twitter metrics will be an ongoing project, so this is just the beginning. If you find this stuff interesting, check back in a few days.